Christmastime is often one for traditions and one of the better theatrical ones has proven to be the big musicals that Sheffield Theatres produce. From Me and My Girl to My Fair Lady to a never-better Company and last year’s Anything Goes that went on to tour, the outgoing Artistic Director Daniel Evans has proved a master at big-hearted, large-scale productions that skimp on nothing to create some of the best musical theatre the country has to offer. This year sees Jerome Kern and Oscar Hammerstein’s Show Boat as Evans’ final show (as AD at least) and it is an undoubted success, a fitting festive farewell. 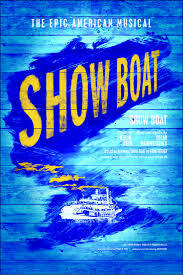 It’s a brave choice too, an unwieldy beast of a story based on Edna Ferber’s novel about the backstage drama onboard the Mississippi show boat Cotton Blossom, using the performing troupe as a prism through which to view several decades of momentous change in the USA from the late 1800s. So Gina Beck’s Magnolia Hawks comes to epitomise the growing women’s rights movement in the stirring ‘After The Ball’ as her married life to Michael Xavier’s Gaylord Ravenal is doomed by his gambling addiction, Rebecca Trehearn’s Julie’s happiness is pole-axed by laws against inter-racial marriage as she ‘Can’t Help Lovin’ Dat Man’, and Emmanuel Kojo and Sandra Marvin’s Joe and Queenie characterise something of the African-American experience and how even on the boat, the intrinsic racial divisions of US society persist. Marvin nails the reintroduced ‘Mis’ry’s Comin’ Aroun” and ‘Hey Feller’ whilst Kojo invests ‘Ol’ Man River’ with something magical as its majestic strains reprise throughout the score. David White’s musical direction makes these classics sound freshly minted and intermittently enhanced as they are by Alistair David’s choreography and the cleverness of Lez Brotherston’s set design, Show Boat is a truly epic experience. Don’t rely on this transferring down to London, make time for a trip to Sheffield tout suite.